It must be the triple-digit temperatures that regularly hang over the San Joaquin Valley like a hammer against white hot steel just pulled from the forge. Or perhaps it is because I was born on the first day of summer, the longest day of the year, the summer solstice. Or perhaps it is because I grew up in the frigid expanse of the Deep Dark North Woods of Maine and it will take a lifetime – or longer – for all of me to thaw. It really doesn’t matter. I’ve been thinking about summer quite a bit lately. More specifically, I’ve been thinking about the summers of my youth. And local lore. In case you forgot, here are the lyrics to that lovely tune. But there was much more to the summer than sitting around listening to a man named Alice. Sure, there were summer jobs and chores and that sort of thing. Summer school for some; summer camp for others. And, occasionally, the dreaded family vacation. Being cooped up in a car for hours upon hours was no way to spend a summer vacation. But there was so much more about summer than those things. There were pickup games of baseball and basketball. There was golf. There was swimming and canoeing and sailing. There were barbecues. There were Red Sox games on the black and white TV. And more. There is something special – mystical, even – about those summer days of youth. Days of personal and community lore, if nothing else. Portage Lake is nestled among hills and mountains of central Aroostook County. State Route 11 winds its way from the south over a hill and down into the flatland where rests the town – Dean’s Motor Lodge, Coffin’s General Store, the post office, a few more businesses, and homes for several hundred residents. Except for the public beach, the seaplane base, and the Forest Service facility, year-round homes and vacation cabins are sprinkled on the wooded hills and flats that make up the shore of Portage Lake. The ancient hills for the most part are gentle and worn down over millions of years of shifting plates, pounding rains, persistent winds, and – a late-comer to the wear and tear – man and machine. A contrast is an outcropping of earth and rock – very probably New England granite – that overlooks the water and town from just east of the lake. Every community has lore. Some of it is good. Some of it is not so good. Some of it is simply neutral. Local lore many times sprouts from older children trying to impress younger children, the local lore that includes stories to scare younger children. It’s the lore passed down from generation to generation to generation of the people who are born, live and die in such places as this. Part of the lore of Portage is a slab of stone known among generations of Portage school-age children as Secret Rock. There was never any treasure or tragedy associated with Secret Rock, at least none that I recall these many years since. No pirates or other scallywags buried booty near Secret Rock. And no love-struck, lovesick couple ever took a plunge from Secret Rock. There were no frightful creatures hiding in the cracks and crevices of the quartz-injected granite, no monsters hiding in the nearby forest. It was simply a rock, a rock not much larger than a tennis court, as I recall. Frankly, there wasn’t much “secret” about Secret Rock. I could see Secret Rock from my childhood home, especially in fall and winter when the trees were free of leaves. And there were times when ant-size figures could be spied crawling up the face of the steep trail that led to Secret Rock. Perhaps the secret was the one most children kept from their parents when it came to potential peril. After all, the trail up to Secret Rock was steep and children of a certain age did not tag along because they could not make the climb. The climb also could not be made in winter. Snow and ice covered the rock and the trail leading up to it. Climbing to Secret Rock was a summertime activity. But it was the lore of the land and climbing the slope to Secret Rock was a rite of passage for generations of Portage Lake children. Not far beyond the rock – at least, not far as I can recall – was another steep climb and the road that led to the local golf course with its holes set out along the hills just beyond the town. It was an adventure for children to climb to Secret Rock and not much of an added strain to continue on to Portage Hills Country Club. We all need local lore. It is part of regional lore and national lore and global lore. It helps bind us a community. It solidifies shared memories of our youth. It gives us a common ground and reminds us that our differences, no matter how massive, how divisive, can never defeat us if we hold to local lore and all that it represents. We all need local lore. We all need our Secret Rocks. Shipyard Brewing Company is based in Portland. This evening I went with the IPA, which I do not find as tasty as the brewer’s regular Export Ale. But it was not bad, either. 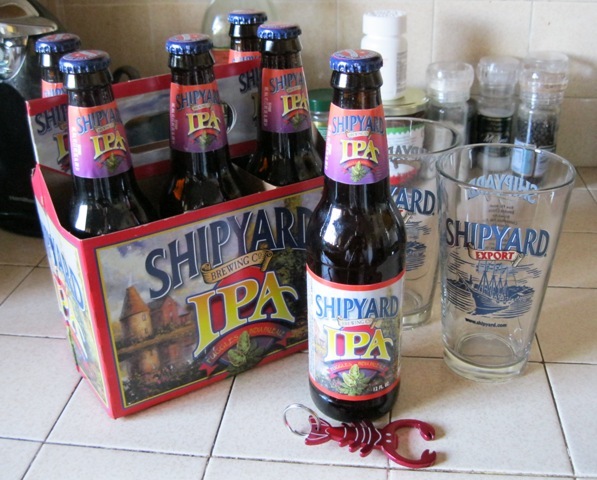 The Shipyard glasses were purchased a year or two ago at BevMo in Stockton. Yes, that is a lobster bottle opener in the foreground. It is also Maine stuff. A Maine native living “away” is required by his or her nature to have around him or her things that conjure up images of Maine. And from time to time that comes in the form of chilled adult beverages. Fortunately, BevMo, the beverage warehouse store, carries several Maine brews, including Allagash, Shipyard, and Sea Dog products. Today’s photo of “Maine Stuff in My California Apartment” includes glasses and brew from Maine. Be assured that no beer was wasted in the making of this blog entry. Oh, and, yes, that is a lobster bottle opener. That also falls under the category of Maine stuff. 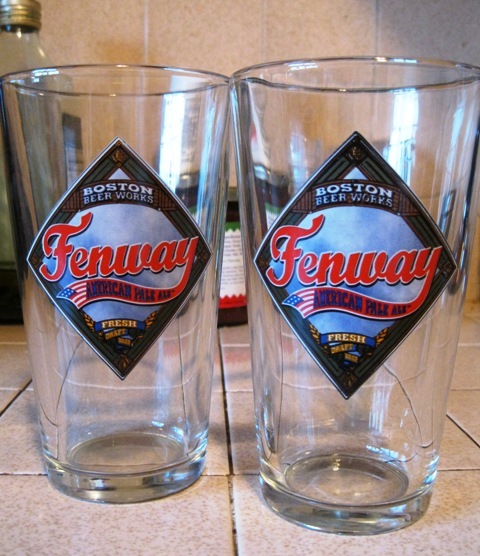 I also included a photo of a couple of Fenway American Pale Ale pint glasses. I don’t recall ever enjoying a Fenway American Pale Ale, but I figured I’d include it because it is a New England beer and I am a Boston Red Sox fan. 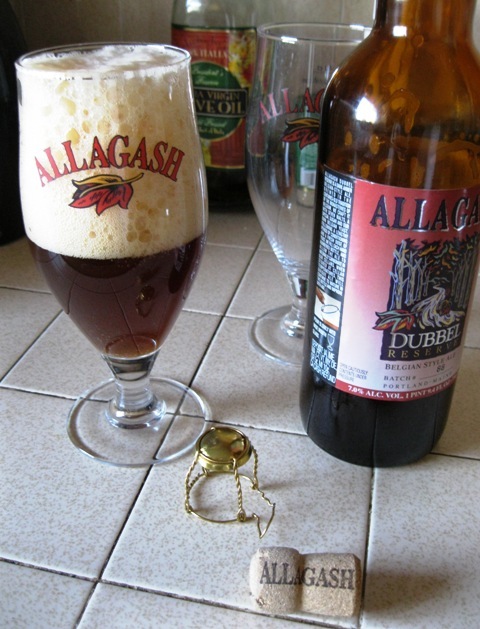 Recently had a bit of the Allagash Dubbel Reserve poured in an Allagash glass. Nice beverage. 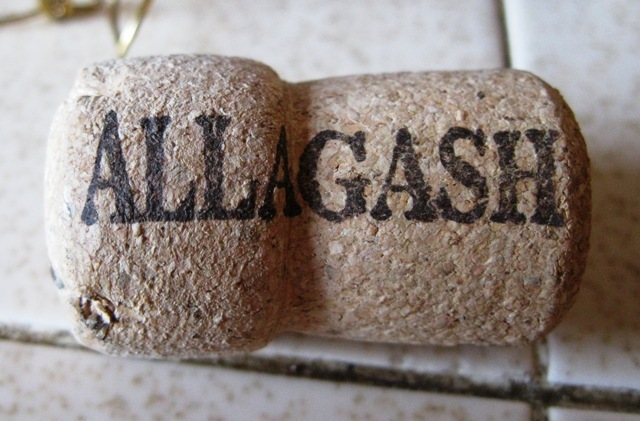 Allagash is based in Portland, Maine, nowhere near the Allagash Wilderness Waterway. The glasses were purchased a couple of years ago. Nice head on the Allagash Dubbel Reserve. 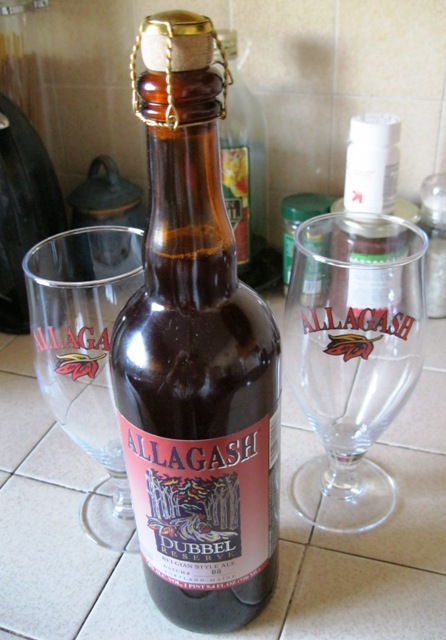 I have tried several of the Allagash offerings and have liked each of them. Gotta love a beer that is corked. OK, so this is a photo of beer pint glasses for a beer made in Boston. But I am a Red Sox fan so I thought I would add this photo of Fenway American Pale Ale glasses along with Maine stuff related to beer. This is an occasional multipart series of photos of things related to Maine that can be found in Keith Michaud’s California apartment. All photos in this series are shot by and are the property of Keith Michaud. Six Red Sox players picked for All-Star Game | The Portland Press Herald / Maine Sunday Telegram. On Baseball: The long shot gives best shot | The Portland Press Herald / Maine Sunday Telegram. Maine student volunteers to be honored at Fenway | The Portland Press Herald / Maine Sunday Telegram. The Yawkey Foundations made nearly $29 million in grants last year. Below is just a bit from the intro to the organizations’ 2009 grant report, a link to the website and a link to the report. The Yawkey Foundations trace their origins back over seven decades to the philanthropic commitments of Tom and Jean Yawkey. With great concern for the forgotten and underserved, the Yawkeys took careful steps to ensure that their legacy would live on through the work of the Yawkey Foundations. The Yawkeys were perhaps best known for their longtime ownership of the Boston Red Sox. More quietly, but with just as much passion and commitment, Tom and Jean Yawkey were also engaged in an unwavering dedication to those most in need. With his last will and testament, Tom Yawkey established the Yawkey Foundation in 1976. Jean Yawkey established the second Foundation in 1982. With thoughtful planning, the Yawkeys ensured that their legacy and commitment to those in need would live on after their lifetimes. The Foundations’ Trustees look forward to continuing the Yawkeys’ efforts to have a positive impact on the lives of children, families and the underserved. For more information about Tom and Jean Yawkey and The Yawkey Foundations, please visit the Foundations website at http://www.yawkeyfoundation.org/. Click on this link to read or download the entire report. Red Sox Notebook: Opener streaks come to an end | The Portland Press Herald / Maine Sunday Telegram. On Baseball: A fitting start to a long grind | The Portland Press Herald / Maine Sunday Telegram.